I didn't measure all the hunks of fabric I have collected over the years. I simply wanted to sort things into boxes. If I'm so inclined to use the stuff, I'll measure it then. Some fabric elicited an, "Oh I remember". Most were, "Now why did I buy this?" 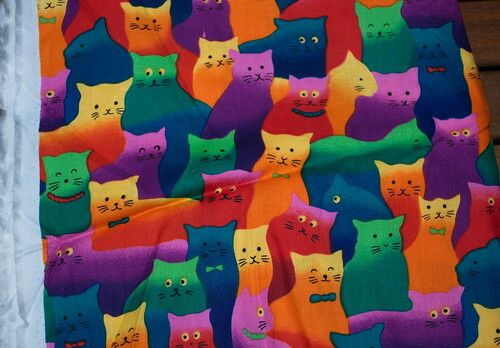 It should probably come as no surprise that I'm attracted to fabrics with a cat design on them. It's probably the same if the sewer is a dog or horse lover. 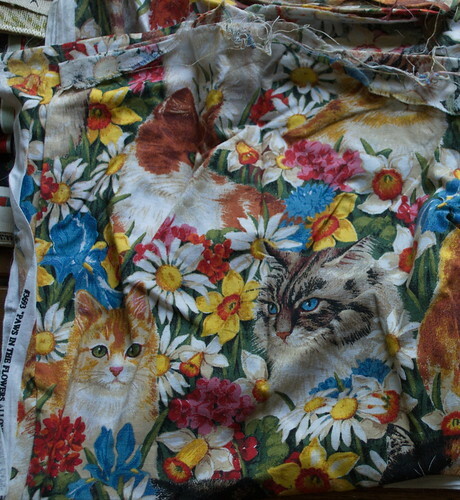 As I was sorting, I found some cat prints. Cats in a garden. I don't know why I got this. For a time, I was wearing vests. They were quite popular about 10 years ago. I think this might have been material I was going to make into a vest. I do like what are called "camp" shirts and it's possible I was going to make this into a shirt. 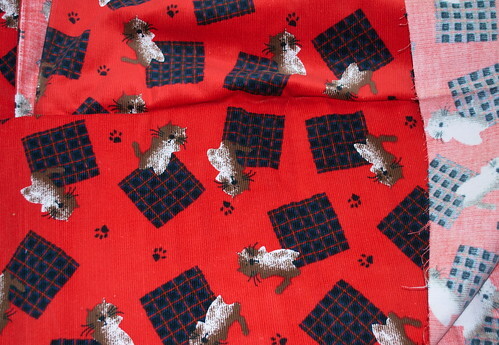 There's a second batch of fabric that I may have had the same thoughts on. It's a cool design. I wonder what I was going to do with it. This last hunk I do remember. This is a heavy corduroy. I bought a lot of it. Years and years ago, I made a red corduroy coat lined with black and white buffalo check flannel. It was a fabulous coat, just perfect for early spring and late fall. I was so proud of that coat. I wore it everywhere. As befits an item of clothing you just love to wear, I wore it out. Eventually, the collar and sleeves frayed. I sewed hem binding on the edges to get more wear out of it. I had to put small squares of fabric where the buttons were because the shanks wore through the fabric. Eventually, I wore the nap of the corduroy off where the pocket was and one of the seams on the sleeves gave out. The lining in the armholes wore through and I would have needed to reline it. In great sorrow, I took off the buttons, cut up the fabric that wasn't worn and tossed the rest away. I lost those fabric scraps when the bag of quilt scraps from fabric I'd saved since Carole was a baby, got wet and then moldy. After cutting up the red coat, I made a bright yellow corduroy coat with black fur lining. It was nice but it wasn't as nice as the red coat. I really missed the red coat. I gave away the yellow coat after a few years. It may have been Hawkeye colors but it just wasn't as good as the red coat. This corduroy was probably purchased when I was out getting something else. I know it was to make another coat in the same pattern as the original red coat. Obviously, I got distracted by something else bright and shiny and never made that jacket. I don't have any flannel in the boxes so if I intend to make the coat, I will have to buy a complimentary lining color. I have a wonderful jacket I wear now. It has a hood. I don't need another fall/spring jacket. Yet, when I saw this, the memories of my red coat came back. No, I don't NEED another spring/fall jacket, but it wouldn't take much money, at all, to make myself another one, a very distinctive one. Right now, however, I have other projects to finish before sewing myself something. As I sorted through the piles, some fabric may never be used and I'd do well to see if I can sell it. There are a lot of people looking for vintage fabric. I have some. This hunk, however, is staying in the box. I might actually do what I intended with it so many years ago.